This refreshingly original work presents a totally new methodology for understanding the concept of aesthetic experience. The traditional model of explaining this experience through the dichotomy of the creator, beholder or critic on the one hand, and the object of art, on the other is challenged and replaced by the new model which the author prefers to call dialogue - a dialogue between the subject and the object, I and Thou. The epistemological and ontological methods which rely heavily on the bifurcation of the subject and the object fails to reveal the true nature of the experiential whole that forms the real core of aesthetic experience. The author's innovative methodology holds the promise for transcending the bounds of all such limitations and distinctions. Most significantly, the conception of "art as dialogue" is stipulated to work not as a means, but as an end, i.e., the consummation of art-experience itself. In this scheme the principle of relationship, not the substance, constitutes the reality of aesthetic experience and the model allows one to encompass within its scope the pre-linguistic, linguistic and trans linguistic phases of the relationship between the man and the art. Dr. Biswas' long training in Phenomenology and Existentialism makes his study of Martin Buber and Michael Polanyi lucid and stimulating. And his immense interest in Modern Indian Philosophy results in a superb analysis of Tagore's and Radhakrishnan's aesthetic approach. 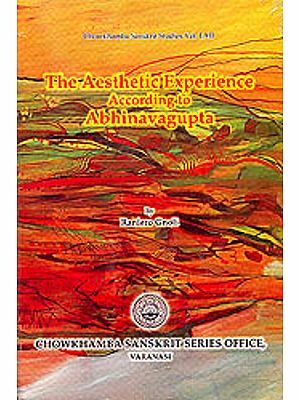 Dr. Goutam Biswas, an eminent scholar of Phenomenology and Existentialism, did his M.A. in Philosophy from Visvabharati University, Santiniketan and obtained his Ph.D. from the Department of Humanities and Social Sciences, Indian Institute of Technology, Kanpur on "Martin Buber's Philosophical Anthropology." He has keen interest in Aesthetics, Philosophy which color all his philosophical works. Being an indefatigable researcher he has made a number of important contributions to many distinguished journals. Currently a Reader in Philosophy at the University of North Bengal, Dr. Biswas has visited France under the Indo-French Cultural Exchange Programme. Dr. Goutam Biswas's monograph is a companion volume to the earlier one entitled Inter-Cultural Dialogue and the Human Image based on the four lectures delivered and the discussion-seminar co-ordinated by Prof. Maurice Friedman focusing on Dialogue; the 'I-Thou' and the 'I-It' relationship. Time and again, Prof. Friedman draws attention to art and dialogue, and the relationship between the artist, the critic and the beholder on the one hand, and the art object, on the other. Dr. Goutam Biswas picks up the threads of this discussion and devotes a full volume to Art as Dialogue. These essays, although written independently as part of a Fellowship at the Indian Institute of Advanced Study, Shimla, have a very close and intrinsic relationship with the nature of discourse which took place during Prof. Friedman's visit to the Indira Gandhi National Centre for the Arts. Therefore it was only logical to include this monograph in the publication programme of Indira Gandhi National Centre for the Arts, since it is both relevant in its programme on cross-cultural studies as also in the Kalasamalocana series where critical writings on the Arts is the focus of attention. 'Aesthetics' and artistic experience as a subject of enquiry has a long history, both in the East and the West. In India the discussion on the nature ofthe aesthetic experience from the point of view of the creator as also the receiver and relation- ships so established can be traced back to Bharata and the Natyaeastra. The discourse has its inception in many ideas expounded in earlier literature but especially the Upanisads and the Ararnyyakas. From the sixth century onwards there was vibrant and complex debate on subject, object, name and form (nama and rupa). Also, the nature of the 'artistic creation' was minutely analysed. Many interpreters applied the basic tenets of the darsanas (philosophic schools) to comprehend the nature of experience, cognition, the art object, the resonance and the response in the spectator or the hearer. The exploration was on the totality of the relational dialogue between and amongst the creator, the created object and the beholder. However, all this emerged from a unified vision, a holistic perspective which saw all phenomenon as fundamentally inter-connected and inter-webbed. While dif- ferentiation was recognised, dichotomy was eschewed. Against the background of a highly sophisticated tradi- tion of dialogue in India, it is interesting and rewarding to find a different but equally relevant perspective on the subject in Dr. Goutam Biswas's volume. His concern is not to identify the commonalities or to emphasize the universals underlying different art forms. He also does not critically examine different theories of aesthetics and art experience. 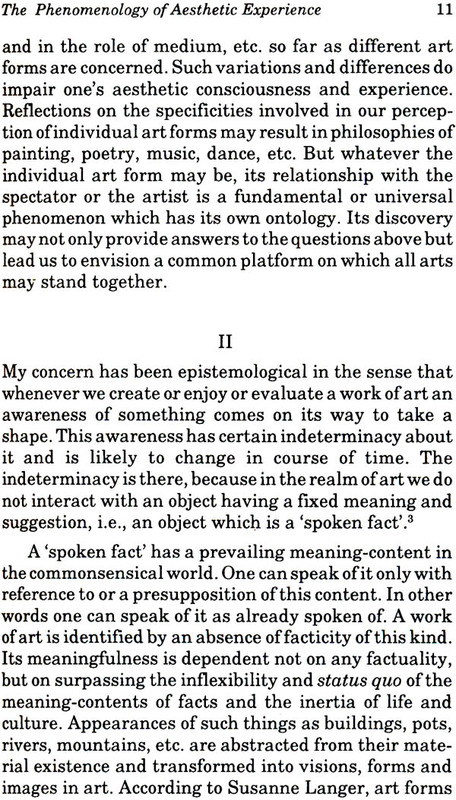 Instead, his concern centres around Martin Buber's concept of Art as Dialogue. As I have observed in the Foreword to the volume Inter-Cultural Dialogue and the Human Image the concern with Art as Dialogue was part of the larger and more fundamental exploration of the 'I-It' and 'I-Thou' dialogue. Moreover, both Martin Buber's reflection and now Dr. Goutam Biswas's work have to be juxtaposed against the immediately preceding postivistic discourse and notions of both 'objectiv- ity' and the role of intellect and reason. The need to recognise relational values and even relational reality arose because of the unbridgeable chasm which has been created by the total dissociation of man from nature, of thing from person, of the inanimate from the animate and of the body from soul. The intrinsic relationship of the senses, emotion, intellect and consciousness was replaced by a paradigm of dualities and binary opposites. Resultantly in the realm of art, a-causal experience, process of artistic expression, the artistic product and communication were no longer seen within a continuum, or in dialogue. There was fragmentation. Art was not related to life and functionality. The artist became autonomous, and art a product. But art emerges from a unified state of experience where dualities and specificities are dissolved and transformed into a new whole. Understandably there were major attempts to re-establish these relationships and re-evoke wholeness. 'Dialogue and the Dialogical' was and is one such approach amongst others to refocus on the impor- tance of process, of the in-between and the relational. The emphasis is on the 'I-Thou' rather than the 'I-It'. Such an approach echoes many concepts in Indian theories of art. As is well-known, according to some Indian theories the artistic experience arises in the consciousness of the 'artist' and is given form through artistic expression, that blossoms in the heart of the spectator. Dr. Goutam Biswas takes us through an engaging jour- ney on the nature of the discourse in the West, especially in modern philosophy - Sartre, Heidegger, Roman Ingarden and Mikel Dufrene - always keeping Martin Buber's work as the centrepiece. He also takes into account the work of scientist-philosophers like Maurice Merleau Ponty. He con- tinues by exploring Rabindranath Tagore's philosophy of Art from a dialogical point of view especially his views on Per- sonal Man and Artistic Truth. 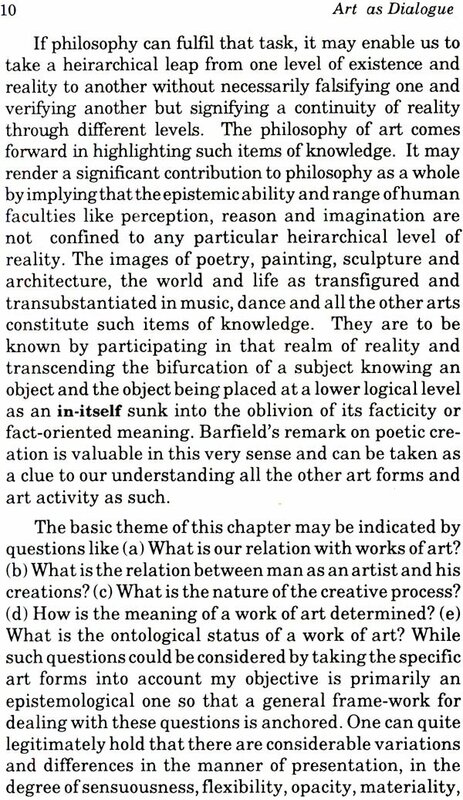 The journey concludes by examining Sarvepalli .Radhakrishnan's phenomenology of Art and his notions on what constitutes artistic knowledge. The guiding principles of the explorations of this uni- verse of dialogue and the in-between is the dynamics of dialogue between the artistic experience and expression in language; and, dialogue preceding and surpassing language. However, dialogue cannot be restricted to language and is, without doubt, more encompassing. Dr. Goutam Biswas endeavours to comprehend art experience as dialogic in the sense of the pre-linguistic, linguistic and trans-linguistic aspects. Pertinently no closed theory of art is being pro- pounded. Only the ideas of modern philosophers as also of Tagore and Radhakrishnan are being examined within the frame-work of phenomenology of dialogue. The five essays on the phenomenology of the aesthetic from diverse but inter- connected points of view, provide very refreshing insights into the nature of the modern discourse on these perennial concerns. They also re-illuminate the discussions on the distinctions between the factual and the real, the specific and the universal, the speculative and scientific theories of truth; these facilitate re-thinking on the notion of intuition, intel- lect and knowledge. The two essays on Rabindranath Tagore and Radhakrishnan clearly demonstrate another way of viewing notions of truth and beauty, and of recognising intuition also as a significant category of knowledge. A reading of these essays will, it is hoped, prepare our readers to receive yet another volume on the subject from the pen of A.K. Coomaraswamy's Transformation of Nature into Art. A.K. 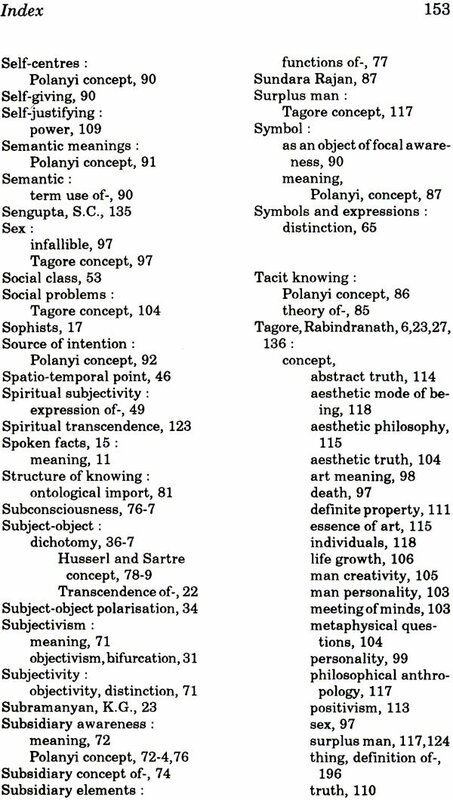 Coomaraswamy too examines these categories but from a very different standpoint and a different language of discourse. The perusal of a revised edition of the 'Transfor- mation of Nature into Art' (under publication by IGNCA) will enable our readers to see the convergences between the modern dialogical frame-work and the reflections on the subject by the exponents of traditional theories of Art in Asia, particularly India and China as also those of one stream of European thought. A discerning reader will easily observe that there have been and are perennial concerns in many streams of thought. In India, reflections on the nature of the artistic act reached an unparalleled degree of sophistication at its stage of 'experience', pre linguistic unformed (arupa), the process of manifestation in artistic form or forms (rupa and pratirupa) and the evocation of an experience through the very specificity of the form (rupa), which transcends form (pararupa). The theories of Chuang Haoof the Tang period in China, those of Zeami in Japan are close parallels and are echoed in the Christian scholastic tradition, particularly those of Meister Eckhert, St. Augustine and St. Aquinas. Since all art tends towards creating a perfect dialogue be- tween the mind of the artist, the formal language of art and the resonance in the spectator, it has been compared to a mystical experience of perfect concord and thus compre- hended as the work of God in the Islamic and Christian traditions. The master Chiah Tzu Yuan had exclaimed "when a painting has reached divinity (shin) there is the end of the matter". St. Thomas believed "it is of the essence of art to bring back into order the multiplicity of Nature and it is on this sense that it prepares all creatures to return to God". The language of discourse of these traditional masters may at first sight appear different and remote from that of the disciplines of modern philosophy, phenomenology or even semiotics yet in essence, it is an endeavour to re-establish the whole and to re-open the dialogue of 'relational thinking' beyond the 'I-It', to the 'I-Thou'. IGNCA seeks to identify these diverse perceptions and tools in cultures, historical periods and disciplines, all with a view to expand this area of knowledge and the depth of dialogue. We are thankful to Dr. Goutam Biswas for having offered his manuscript to the IGNCA. I would also like to record my appreciation of the willing help and assistance of Prof. B.N. Saraswati, Prof. S.C. Malik and the co-publisher in the production of the monograph. THE phenomenology of aesthetic experience marks a significant direction of thinking in the history of modern philosophy. The writings of Moritz Geiger, Jean-Paul Sartre, Raymond Polin, Martin Buber, Martin Heidegger, Maurice Merleau-Ponty, and others have contributed immensely towards phenomenological formulations of issues and insights relating to art and aesthetics. Sedulous research in this area has produced seminal works like that of Roman Ingarden and Mikel Dufrenne. The realisation that a philosophy of art without an account and analysis of aesthetic experience is inadequate and lifeless is because of this trend of thought and research. Doubts concerning the general philo- sophical assumption that an object without an actual or possible reference to experience is abstract, and experience without any content is empty seem to make no sense and are philosophically unproductive. Phenomenologically speaking, experience consists in the directedness of consciousness upon some object, be it an object of cognition, emotion or imagination. The expression of any experience is dependent upon the way consciousness is related to the object. A scientific formula or theory is an expression of some experience of an object or phenomenon. The universe of discourse that is shaped by this scientific method stands a part from the universe of discourse that is formulated by artistic experience and expression. Philosophy not only synthesises different types of experience according to the different ways consciousness is related to its object - and thereby envisages a general theory of experience at various levels - but it also explores into the uniqueness of each type and imbibes insights from it. Keeping the latter task of philosophy in mind, art experience is visualized as an important area of study for the philosopher. Today, the triad of consciousness, aesthetic object and art expression, therefore, determines the scope of a philosophy of art. Art experience is definitely the primal source of this philosophy, since it is an exudation of consciousness from the cloister of its privacy to the world. This is why embalming works of art in archives has little to contribute to any philosophy of art. Heidegger admitted that all works of art do have a "thingly charac- ter" and they are "shipped like coal from the Ruhr and logs from the Black Forest". But, he said, "shippers or chairwomen in museums may operate with such concep- tions of the work of art. We, however, have to take works as they are encountered by those who experience and enjoy them". Sartre would perhaps agree that works of art in archives or museums are beings-in-themselves, unencountered, and susceptible to oblivion. This is the reason for which he held that a work of art is 'unreal' as compared to an object or being-in-itself which is 'real'. "There is no realisation of the imaginary, nor can we speak of its objectification. Each stroke of the brush was not made for itself nor even for the constructing of coherent real whole (in the sense in which it can be said that a certain lever in a machine was conceived in the interest of the whole and not for itself). It was given together with an unreal synthetic whole and the aim of the artist was to construct a whole of real colours which enable this unreal to manifest itself." But a work of art as something unreal paradoxically becomes very real for human consciousness as it promises an escape from superfluity and contingency of our day-to-day empirical world. Perhaps Sartre's commitment to a dualistic on- . tology of being- for-itself (Pour-soi, human subjectivity) and being-in-itself(EnSoi, object) did not permit him to ascribe any reality to art objects. But his contentior implies that they enjoy a privileged status, a sort to reality with a difference. The conception of an aesthetic object as a 'quasi- subject' leads to the problem regarding the ontological status of art objects. While art objects act and exist as beings-for-themselves, contribute to and enrich the hu- man experiential perspective in a way so that they can be differentiated from their mere physical factual being (as human subjects are distinguished from their dead bodies) they at the same time retain their identity as separate from artists, beholders and critics, i.e., from human subjects. This problem seems to be unresolvable and the unique mode of existence of art objects appears inexplicable. 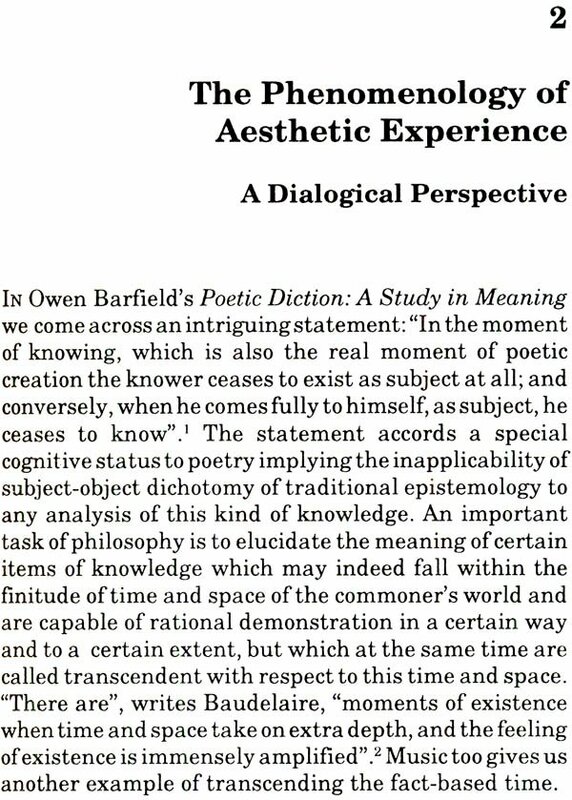 But it is so only in the context of an ontological bifurcation of aesthetic experience into the subject of such experience and its object. Concepts of dialogue and communion may be invoked in this case to suggest an alternative ontology. In dialogue the 'space' between the experiencing being and that which is expe- rienced becomes onto logically significant. I should like to suggest that art experience is basically a dialogue between the creator, the beholder and the critic on the one hand, and the art object on the other. The under- standing of an art object is possible within this experi- ential context which is constituted by the relational sphere or the 'space' between I (the artist, beholder, critic) and thou (the art object). 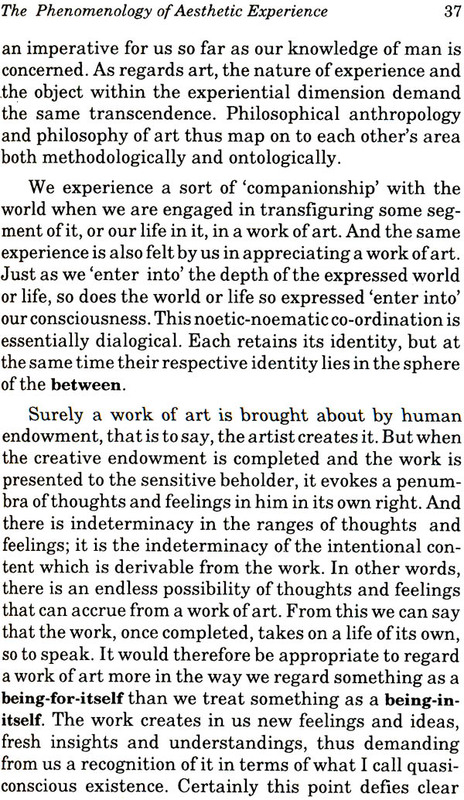 The primary task of the phenomenology of aesthetic experience could then be one of showing the way to a transcendence of the disjunc- tion of subjectivity and objectivity in art, and of explicat- ing the nature of dialogue and communion not only as a means of this transcendence but also as an end, i.e., the consummation of art experience. This work is an at- tempt to perform this task.